Many of us grew up with Israel as a reality, but the privilege of living in the era of Jewish redemption is fragile: The only way to embrace it is to exercise the responsibilities it entails. What I found in Hadassah—and have found every day since I joined in 1973, during the Yom Kippur War—is a passion for our mission of nurturing, healing, defending and improving the Jewish people and state. As I write, rockets fired from Gaza are once again striking Sderot and nearby communities. Thousands of Israeli civilians have huddled in bomb shelters in recent days. A new study reports that more than 40 percent of Sderot’s children suffer from post-traumatic stress disorder. Wherever else I am, part of me is racing to the bomb shelters with those under fire, hanging on every news update. We are not mere spectators. Hadassah gives us the means to address threats as well as worry about them. The Hadassah Medical Center treats the sick and injured and heals their wounds. 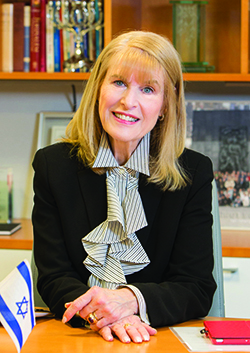 The Hadassah Medical Organization is also an expression of our Zionism and of our Jewish ethic: Hillel’s words echo across 2.000 years—”If I am only for myself, what am I?” All who come through our doors are treated equally—Jewish and Arab Israelis, Palestinians from the West Bank and Gaza. The Israeli Army entered Syria at great risk to evacuate White Helmet rescue workers and their families. Our medical staff is treating Syrian children in need of urgent care. My passion for the work we do explains why I don’t sleep much. When in Israel, I spend a lot of time in meetings and at ceremonies, but since it’s is a small country with a large history, I can’t take more than a few steps without feeling touched by the past and inspired to shape the future. On arrival in late June, I went straight from Ben-Gurion Airport to Ben Shemen Youth Village, a quiet agricultural school near Lod. Among its graduates was the late Israeli President Shimon Peres; one of the village’s prized possessions is Albert Einstein’s telescope. I was there for one of a series of ceremonies leading up to the dedication of our new Rehabilitation Center on Mount Scopus, which will feature a pathway of cement tiles bearing footprints, much like Grauman’s Chinese Theater in Hollywood—except our impressions come from Israel’s defenders, leading military figures, wounded soldiers and terror victims. Stepping onto the wet tiles at Ben Shemen that day were former Army Chief of Staff Gabi Ashkenazi and Aharon Karov, a platoon commander who suffered severe injuries in Gaza in 2008, spent three months in a coma but survived and, five years later, ran the New York Marathon. Is there tension between being both a Jewish and a democratic state? Of course there is. But for 70 years it has been by and large a creative, synergistic tension. We fear the new law tips the scales and emphasizes division more than unity. We urge that it be modified or amended. Hadassah reflects Israel’s diversity. We are a Zionist institution in which Jewish and non-Jewish doctors, nurses and technicians serve Jewish and non-Jewish patients. Our experience, our history and our ethics teach us to advocate for what we believe. Israel needs us to speak loudly about what unites us, which is certainly greater than what tears us apart. As the new year approaches, let us dedicate ourselves anew, in medical care and in society, to equality. To all of you, Shanah Tovah. I am also a child of the beginnings after the horror of the Shoah, and I have a different opinion. The intention, intention, intention behind the founding was to create a sanctuary for the people expelled from their Biblical homeland and destined to wander all over the earth. Yet, miraculously we did not lose our faith and our religion. Israelis are right to resist thev watering down of that intention. The new law merely codified that intention while at the same time preserving the civil and secular rights of all citizens. I agree with you completely!! Well stated!! I totally concur with Michelle Green’s comments! Ellen Hershkin’s “interpretation” of the bill is sadly a spin of her choosing and not at all a diversion from Israel’s Declaration of Independence as her article concludes. I will not reiterate your outstanding thoughts, Michelle, but wish to thank you for expressing them so eloquently! L’ Shana Tovah!